The bullets flew half a world away, but the horrors of war came home in the battle-marred bodies and minds of Australian soldiers. 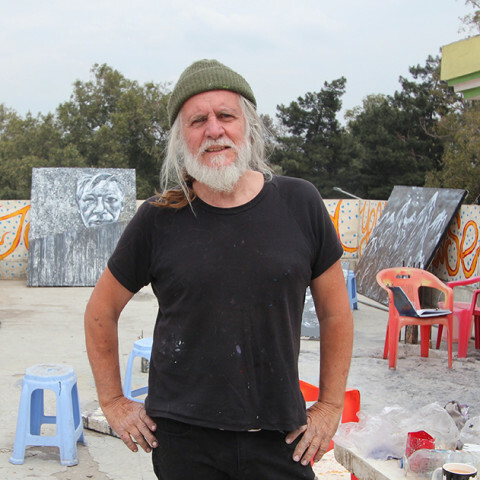 100 years after armistice, Museum of the Riverina presents the work of renowned artist George Gittoes to survey the rending impact of conflict on soldiers and civilians alike. The Realism of War: Works of Humanity by George Gittoes highlights the considerable contribution to national defence made by members of the armed forces, and the public’s evolving attitude towards conflict over the past century. A witness to conflict zones and atrocities in places like Rwanda, Iraq, Nicaragua and Afghanistan, Gittoes creates striking images of people pushed to the limits of their humanity. His images pry open the door to a conversation about what it means to be human at the very limits, where petty myths, tired illusions and worn-out symbols collapse. This is the dare at the heart of his practice – to activate the imagination rather than fear, and to create hope in the face of chaos. A century of war and peacekeeping efforts have exposed the darkest and most noble parts of the Australian spirit, feeding powerful insights and persistent myths about our national character and place in the world . These evocative art works reveal the experiences of Australian soldiers within modern theatres of global conflict, prompting reflection upon the traumas brought home to a peaceful land from battlefields abroad . The exhibition will include a selection of the artist’s paintings and drawings, photographs, service records and films. The Realism of War: Works of Humanity by George Gittoes is on exhibition 4 September - 18 November 2018 at Museum of the Riverina’s Historic Council Chambers site. Dr George Gittoes is an eyewitness in the world's contact zones. Visiting the battle- and killing-fields of Rwanda, Iraq, Nicaragua, the Philippines, Bosnia and Afghanistan, Gittoes captures the atrocities and attacks on basic human rights. He produces poignant, rare images of the aftermath of terror, shock and death on the edge of human experience. Gittoes is described simultaneously as a figurative painter, a modernist, a postmodernist, a social realist, a pop artist and an expressionist. Also an acclaimed filmmaker, Gittoes has produced several films covering the War on Terror, including 2004’s Soundtrack to War, which was televised in Australia and on MTV. Gittoes is a Member of the Order of Australia and was the recipient of the Sydney Peace Prize in 2015.